Different sorts of wooden buttons, either raw or varnished/painted, with classic or novelty shapes, for all your scrapbooking and patchwork needs. Laser-cut wooden buttons with beautiful designs, perfect for patchwork. Some are of very large size. Use them to customize your favorite projects with a quality three-dimensional touch. To be used on garments and made of painted or varnished wood, you will also find them in this section. 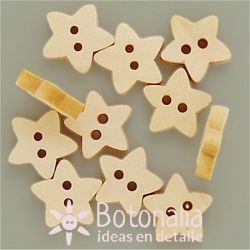 Product Description: Decorative button two holes with the shape of a five-pointed star. 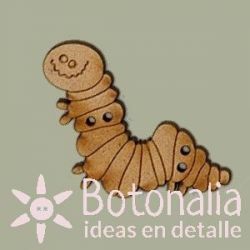 Perfect for crafts, patchwork, card making and scrapbooking projects.Content: The price shown is per unit.Diameter: 13 mm approx.Thickness: Variable, between 3 and 3,5 mm approx.Material: Wood barnizada. Product Description: Decorative button with two holes with the shape of a doll. Perfect for patchwork and scrapbooking projects, as well as any other sewing or craft projects.Content: 1 Button.Diameter: 28 mm approx.Thickness: between 2,5 and 4 mm.Material: Wood. 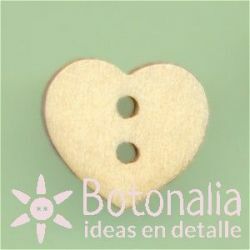 Decorative button with two holes with the shape of a heart. Both sides are flat. Perfect for crafts and projects of scrapbooking, cardmaking, patchwork, etc. Content: The shown price is per unit. Diameter: approx. 12 mm. Thickness: Between 3 and 4 mm approx. Material: Wood. Decorative button with two holes with the shape of an elongate heard. Perfect for crafts and projects of scrapbooking, cardmaking, patchwork, etc. Content: The shown price is per unit. Diameter: approx. 20 mm. Thickness: Between 3 and 4 mm approx. Material: Wood. Decorative button with two holes with the shape of a heart turned to ones side. Perfect for crafts and projects of scrapbooking, cardmaking, patchwork, etc. Content: The shown price is per unit. Diameter: approx. 24 mm. Thickness: approx. 3 mm Material: Wood. 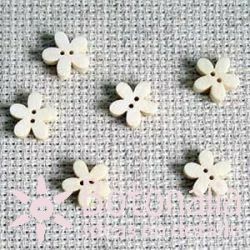 Decorative button with two holes with the shape of a little flower. Perfect for crafts and projects of scrapbooking, cardmaking, patchwork, etc.Content: The shown price is per unit.Diameter: approx. 11 mm.Thickness: between 3 and 4 mm (it can be different from one button to another)Material: Wood. 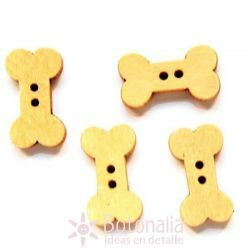 Product Description: Decorative button in wood with the shape of a bone. To be used in scrapbooking, card making, crafts, patchwork and general sewing projects.Content: Price is per unit.Diameter: 18 mm approx.Material: Vernished wood. Pack of wooden buttons in green shades with charming prints from Mirabelle Collection. Manufactured by Santoro and presented in a pretty box/card in decorated cardboard. Perfect for crafts and projects of scrapbooking, cardmaking, etc.Content: 12 different buttons in 2 sizes.Diameter: 18 and 25 mm approx.Material: Printed wood. Decorative button with two holes with the shape of a little teddy bear in natural wood color. Perfect for crafts and projects of scrapbooking, cardmaking, patchwork, etc.Content: The shown price is per unit.Diameter: approx. 30 mm.Thickness: approx. 2 mmMaterial: Wood. Product Description: Button with the shape of a fly. Perfect for crafts, patchwork, card making and scrapbooking projects.Content: The price shown is per unit.Diameter: 22 mm.Thickness: 3 mm approx.Material: Laser-cut wood.